VOCs (volatile organic compounds) add health hazards and compromise air quality. When VOCs are off-gassed indoors, they contribute to sick-building syndromes, allergies and illnesses. Good ventilation and heating systems help reduce these harmful emissions. If you’re interested in reducing off-gassing and VOCs in Calgary homes while improving your heating system’s efficiency and comfort, look to our energy efficient heating systems. Our hope is to provide your custom home with the best heat source available–one that improves your health and well-being. Your dream home should save energy, reduce allergens and maximize comfort. Read on, discover the benefits and drawbacks of specific heating sources and determine what system is best for Calgary homes like yours. Much like feeling the sun warming your face through a window as you look outside, radiant heating directly warms bodies in a room. This system offers a more overall, even heat, and is much more efficient than conventional forced air systems. Not only is radiant heat comfortable, unobtrusive and quiet, but it doesn’t blow dust, allergens or VOCs into your living space. Radiant heating systems also eliminate heating loss through ducts, rooftops, drafts and cold spots. Since they don’t blow air, they won’t dry out your room or emit unwanted particles from walls. Radiant heat can be installed in the floor, wall panels or ceiling of your house. We specialize in flooring systems. Electric and hydronic floor heating systems are the most effective and popular methods of radiant floor heat. Using cables built into the floor or electrically conducted plastic, electric radiant floors work like an electric blanket. The more expensive type, electric systems are best used for supplemental heat. 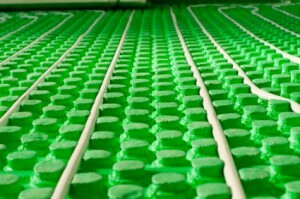 Hydronic radiant floors, which rely on hot water, are the most popular and cost-effective system. Working water through a boiler or water heater using tubing patterned into the floor, hydronic systems are designed to heat the whole house. Using minimal electricity, they never overheat a room. A tip: leveraging your floor’s thermal mass can reduce energy costs. A significant thermal mass, like that of a concrete floor, helps store heat during utility companies’ low time-of-use rates. By charging your floor with heat during off-peak hours, often from 9AM to 6PM, your house can stay warm an additional eight or ten hours without further energy input. Most radiant panels for homes are heated electrically, though we also use solar heat panels for hot water production. As a whole, radiant panels offer the quickest response time of any heating technology. Though non-solar panels can be expensive to operate, they’re perfect for supplemental heating, since they can be set up to only heat the room you’re in currently. They’re especially useful if you tend to live in some rooms more than others, or for a home addition. As with electric and hydronic radiant floors, having significant thermal mass in Calgary homes helps store heat from radiant panels longer throughout the day. We can help you improve your home’s thermal mass. Comparatively, electric forced air systems deliver heat by blowing warm air out the fan through a network of ducts. Many homeowners with forced air systems and electric baseboard heating are switching methods to reduce costs, like radiant heat. However, since the installation cost of radiant heat is more than forced air, the switch isn’t always easy. In many cases, forced air heating systems are less efficient and comfortable while having more issues with circulating off-gassing, harmful VOCs and allergens. However, we offer heat recovery ventilators, better insulated building envelopes and better thermal mass to improve some of these conditions. In most cases, a hybrid system is used where both are installed together to leverage the benefits of each.